I couldn’t resist to be the first to comment before I have even read anything, though I have noticed at least 2 centre directories…this is monumental! Will have much more to say I am sure! Oh dear….I feel like getting out the tissues! Have just finished reading this and it sums up my feelings entirely….the glory days are certainly gone and what remains is a sad little place! 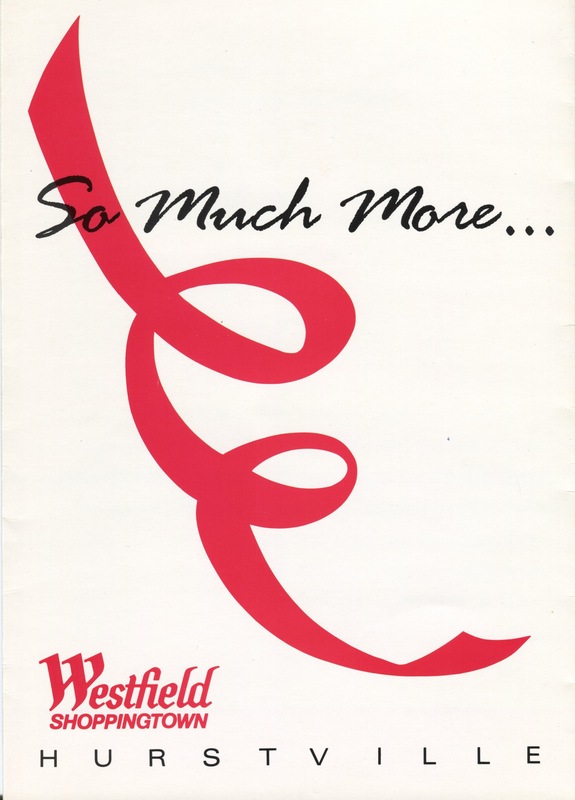 Thanks for stirring up memories of shops that I would have otherwise never remembered from a time when Westfield was worth shopping at and had everything you needed. As for what it has become since 1998 onwards, don’t get me started! Don’t worry Petta, there’s just nothing to say. Don’t worry, history never repeats …… the bust is so much worse than a boom. 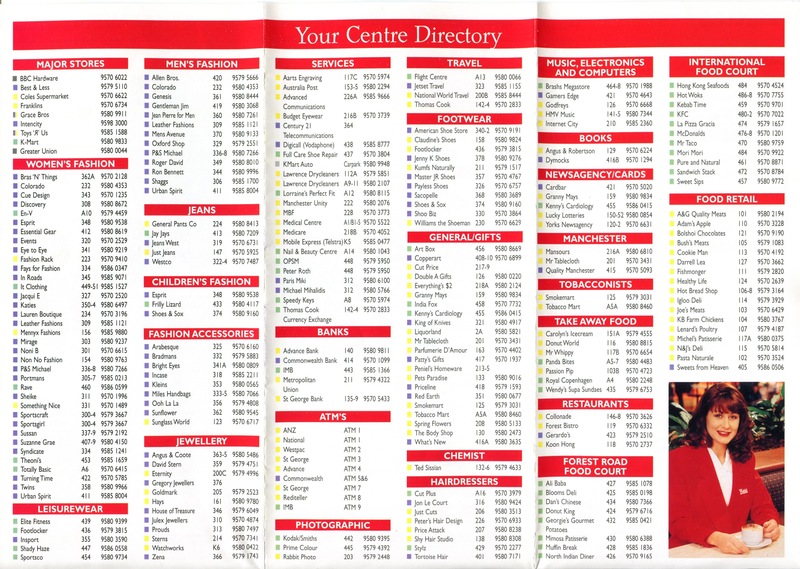 The fascinating thing about looking at these shop directories is it so well demonstrates the decline in quality and variety that slowly commenced from about 1997 to where we are at now. This has steadily happened in the retail sector in general, particularly in the fashion area, but, particularly in Hurstville. This is probably most evident to me as it’s a place dear to my heart having been my local shopping centre until only just recently. 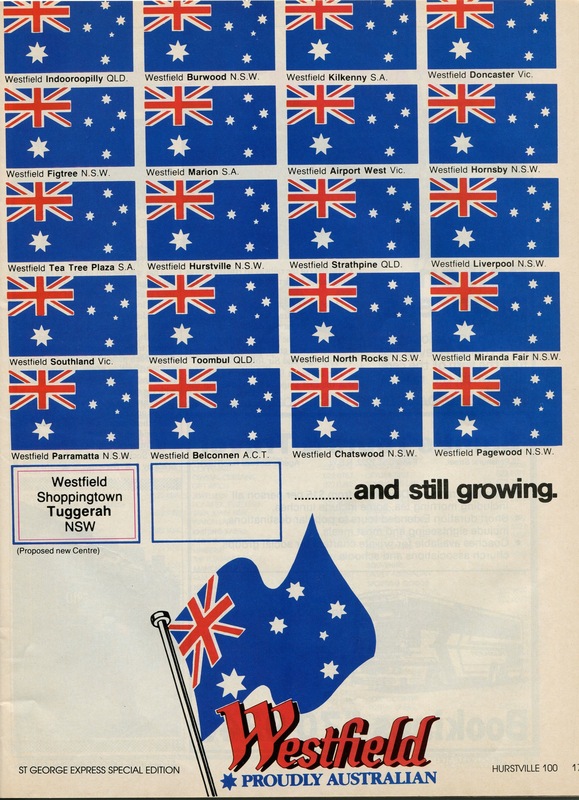 The thing that marked those glory years of the centre up to the late 90s encapsulated by those store directories is that much of the merchandise sold in those stores was made in Australia eg Inroads, Essential Gear, or was quality imports from places like Italy eg Claudine’s shoes. Even the things made in China were made more to last. Many of these stores have either become totally extinct or started making there items abroad which lead to the influx of ” bargain stores” which has contributed to the demise of the centre. When Boss Hair Team bailed, it was time to cash out. The biggest classic was Hair 2000 as it didn’t even make it to the 90s! Thanks for your work in writing this series, Michael. 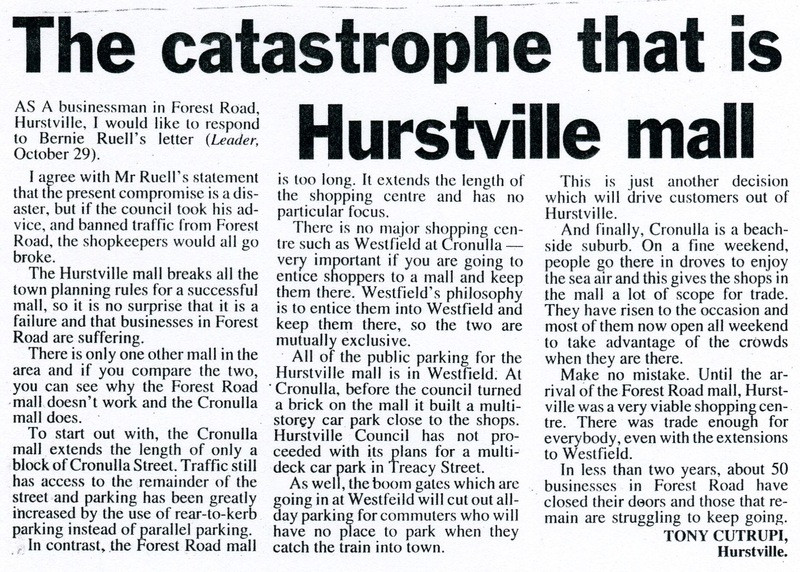 It’s one of the most interesting things I’ve read in years, as I grew up in Kogarah and was at Hurstville Westfield almost every day on my way home from school. 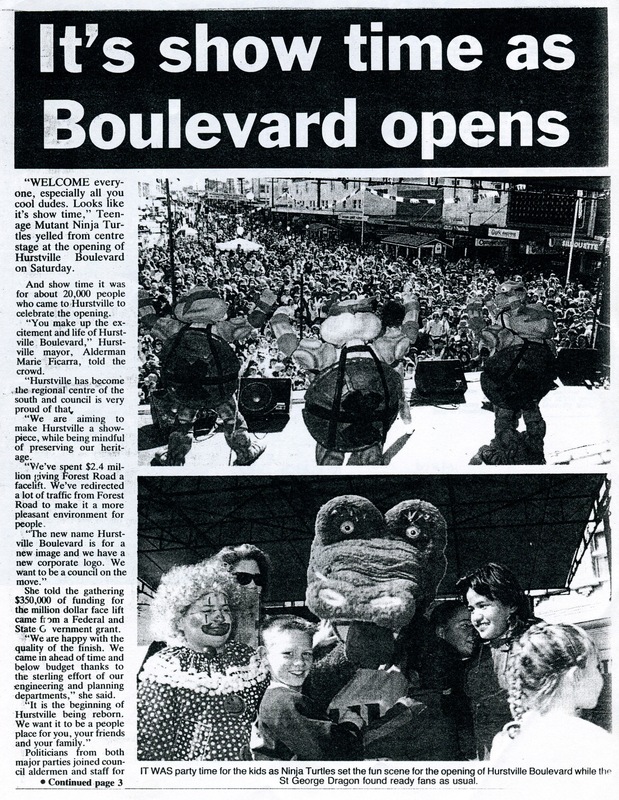 I was 8 years old when they did the 1990 expansion and I remember the excitement when it re-opened. I haven’t been there for about 5 years (I live on the north shore now), and found the place noticeably more crusty than what I remembered. I’m bummed to hear that it really is such an unpleasant place to go as I was thinking of going to re-kindle some memories. I did once get somewhat roughed up by some “youths” at the Greater Union around 2000 so I relate to that bit, and that memory has probably kept me away sub-consciously. 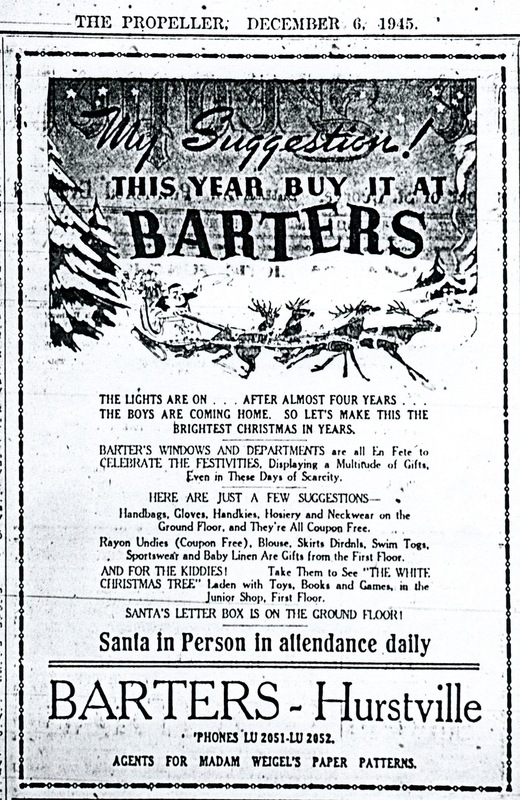 Don’t you like how Best & Less used to be a “major store”? 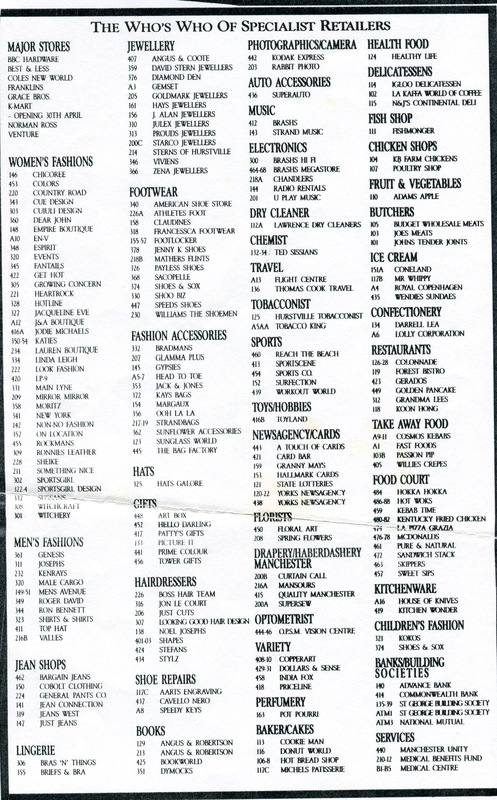 Even in the 1995 store directory it’s labelled as that. Can you imagine B&L being anything to brag about these days? Although good on them for at least staying in business, unlike Venture, Chandlers, etc., etc. Don’t bother going back you will only get depressed as I do when I go back every few months (and I was 16 when the centre extended in 1990 and was my main hangout)….now that my memory has been completely retrieved as to what shops used to be there, I will be walking around in a trance wishing I could bring it all back if only for a day! You’re very welcome, KJ. I just figured I shouldn’t have to suffer alone. Michael, if you have the energy after your outstanding Hurstville effort, would you be inclined to do a similar story on Miranda Westfield? It would be greatly appreciated. 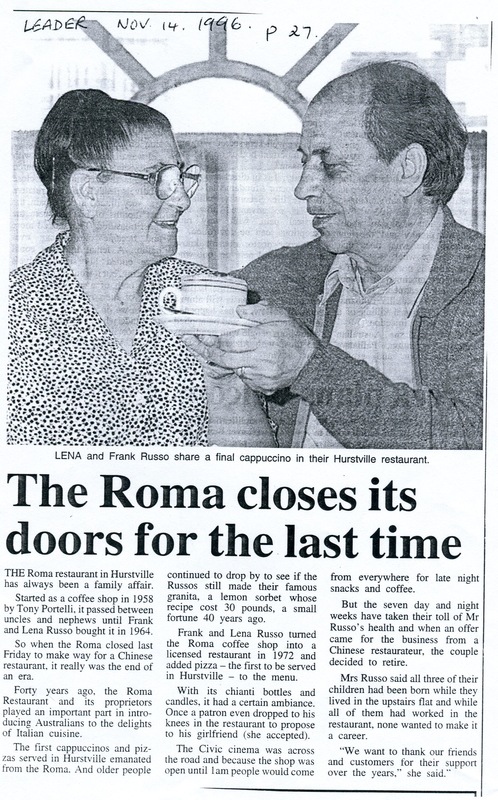 I didn’t start visiting there until late 90s after hurstville began to lose it….it seemed so far away to travel in those days, over the bridge and all. Also Southgate Sylvania with its old Village Cinema complex would be a great story to tell. The last letter says it all. I remember having Arby’s at Westfield, it didn’t stay long. Also remember there was a circus on the site of new Westfield after the houses has been demolished and before construction started. It was there for quite a few weeks. That’s right it was an Ashton’s circus and I went there when it was there before construction began as you say. 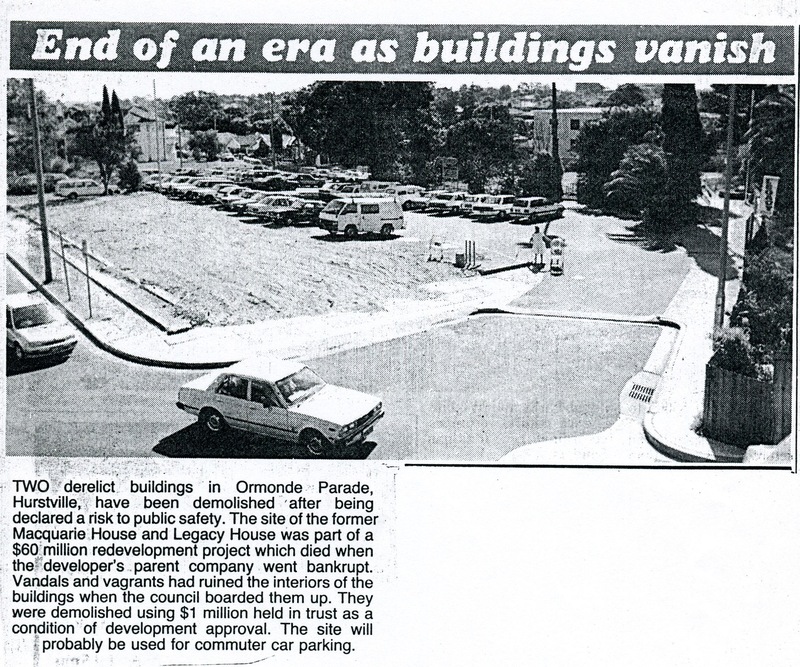 I also remember riding my skateboard in the car parks and using the ramps on the Sunday and public holidays when the centre was closed. Can’t do that anymore. Wow. I was absolutely blown away by your work. Well done. But I am so sad. Really, so sad. I was 5 when the centre was being extended. I don’t remember much before that. 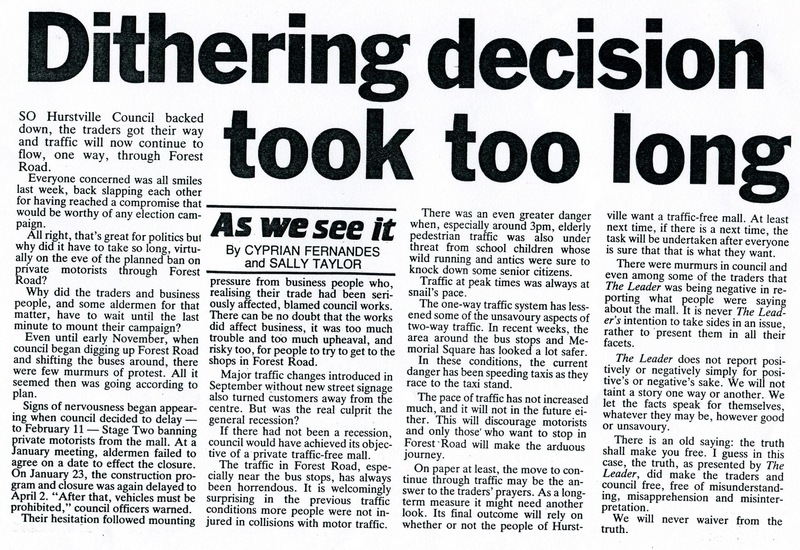 But I remember going for a skid on my shins down the unfinished ramp connecting Forrest Road to the centre. That was embarrassing. 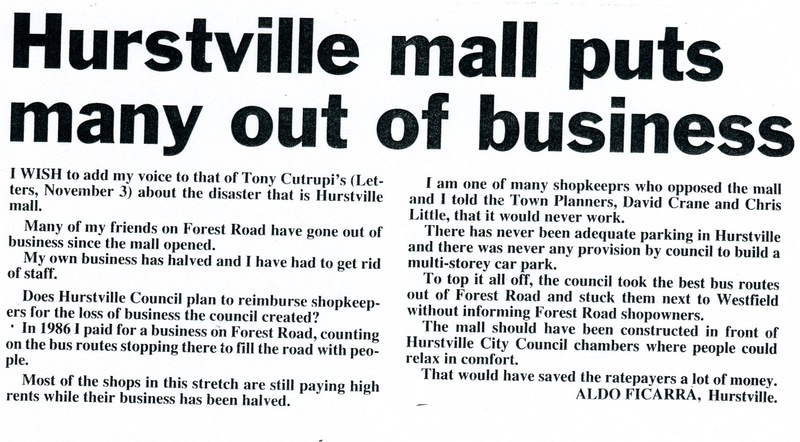 I grew up between Roselands and Hurstville, in Bevo. 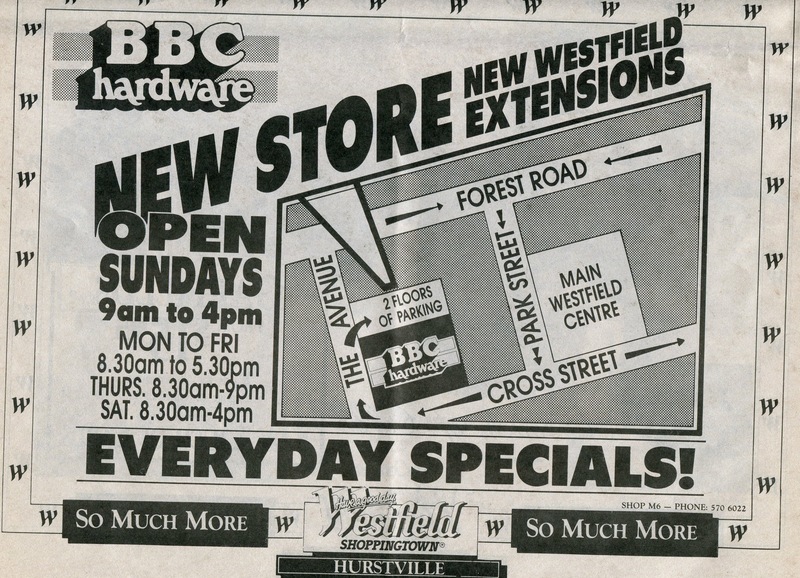 We would go to Hurstville probably every week. There definitely has been a sharp decline from 1998 onward. We would park the car up in the cinema lot at the top (one with the lifts to GB’s) and the homies with their adidas striped pants parked on the stairs of the cinema would stare and laugh at me with my gangly legs, outdated outfits and all around nerdish look. Awesome stuff for a 14 yr old. It would have been about two years ago that the last original tenant of the centre left. As you all probably know, Westfield management can be brutal with expectations on rent and the fact that you have to renew your store façade and interior every five years. That throws a lot of businesses out of the game. There was also the local folklore that because of a rat infestation the top food court wouldn’t be renovated until it was fixed. 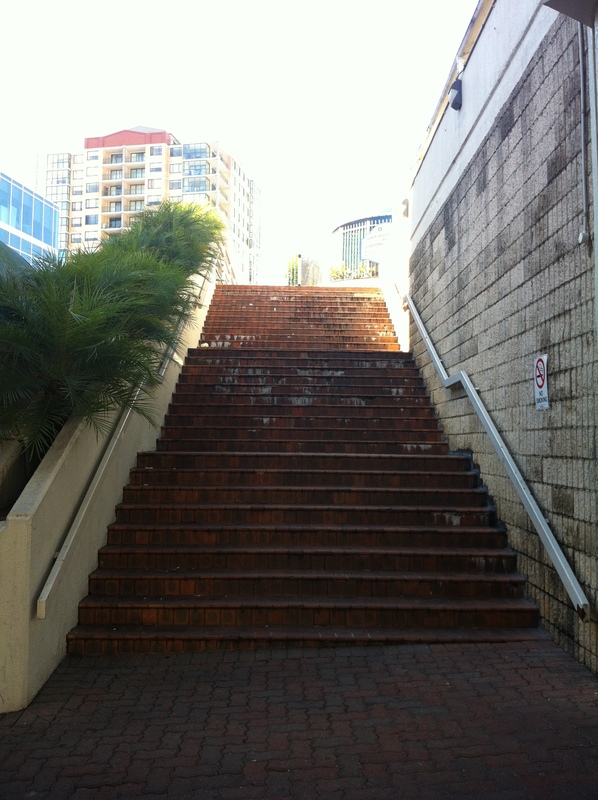 They renovated it… so whether it was fixed or not is a different question! 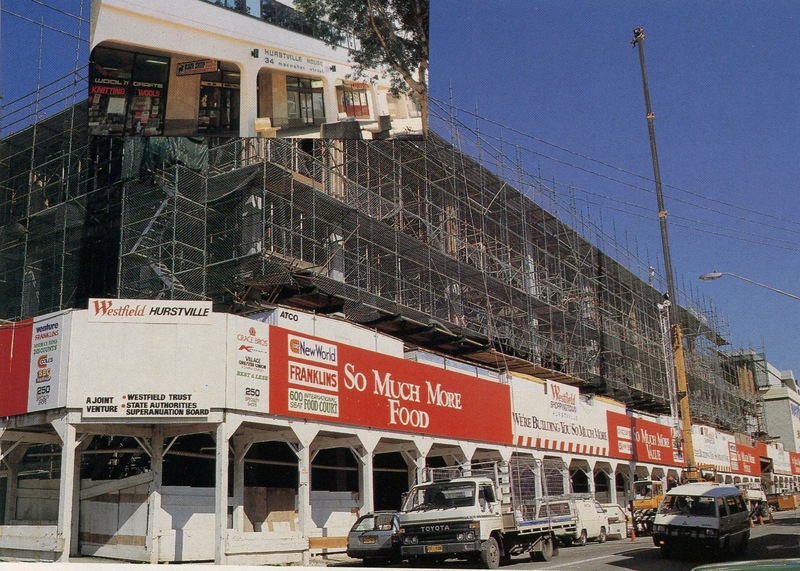 Plus I don’t know how many would remember this, if I am wrong or not, but the bottom food court, the one that has Gloria Jeans – that wasn’t there originally, it was a later addition? 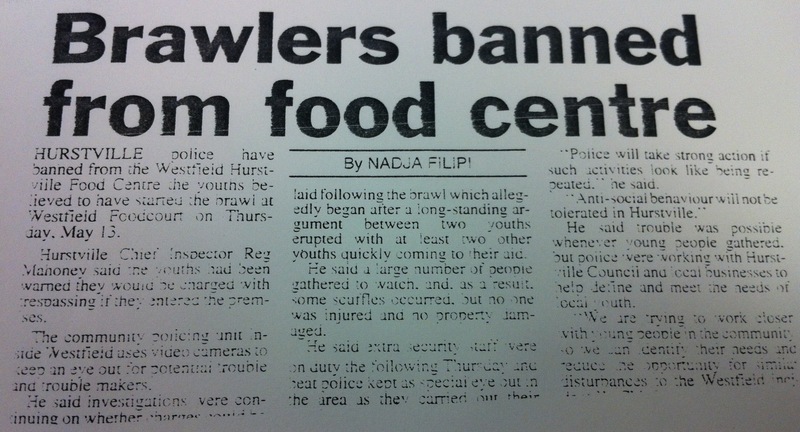 Have some vague memories about that and having called it the “new” food court for a long time. GB’s also had their cafeteria as well, where you would get your tray and push it along the silver bench with your purchases. That was located between the now men’s section and the women’s intimate apparel section. You can still see the floor shaped to it. It had booth seats similar to maccas and a pale blue and cream interior. And finally, wow, this post is long! I was there the day that Toys ‘r’ Us opened. I was at the front door thinking, great! hardly any queues! And looked up and the queue was all the way back up to where Priceline is now (used to be a menswear shop) that was a fun wait. Hmm. 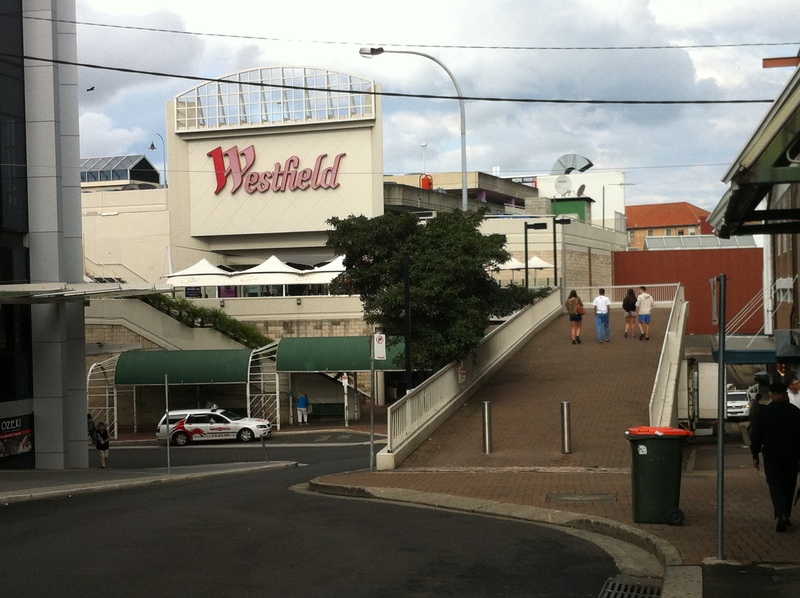 But Catherine, just think: when you skinned your shins on that ramp, you and Hurstville Westfield became ONE. Catherine, I went to Danebank too from kindy to year 6 and lived in carrington ave until 1999 when I got married and then Dora until 2009 so I have lived through all the change and heartbreak of seeing the sad place it’s become. 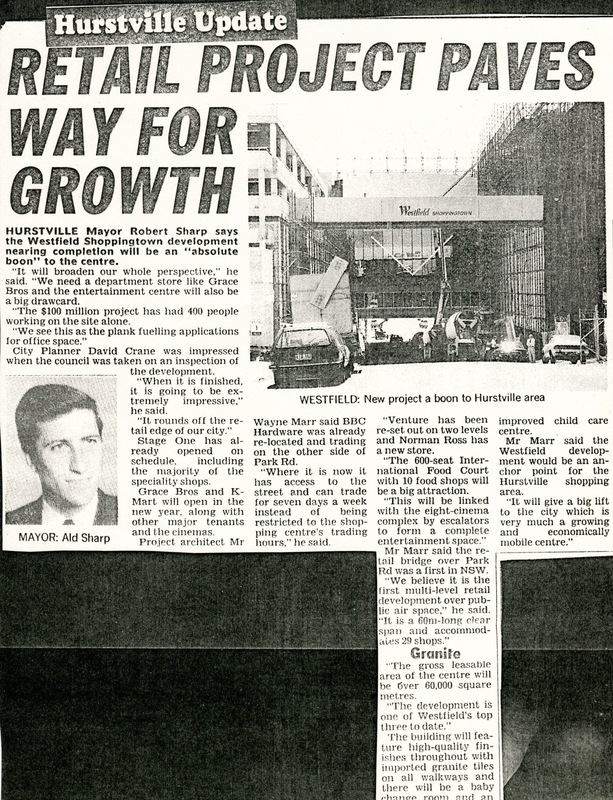 I was 15-16 when the 90/91 extension was completed so remember it vividly and all the new shops that opened. 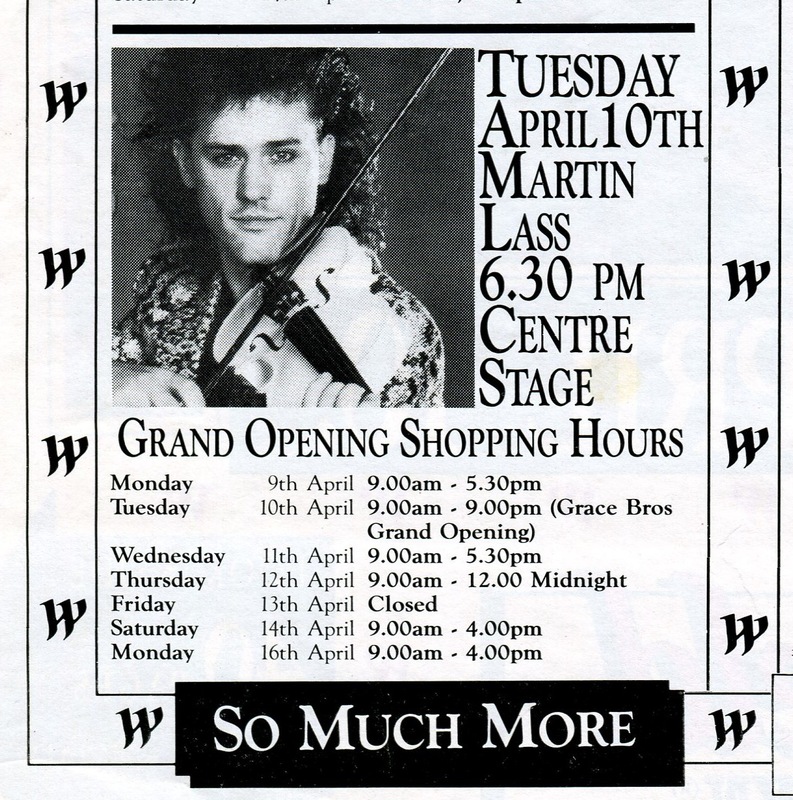 I remember the excitement when we finally had a Grace Bros and didn’t need to go to Roselands. Strangely I don’t remember the caffateria you describe though understand where you described the location. I think that later became a ticketek outlet if I recall correctly. I remember they even sold fabrics and sewing patterns in those days and remember sitting in the little room with my mum going through the pattern books. 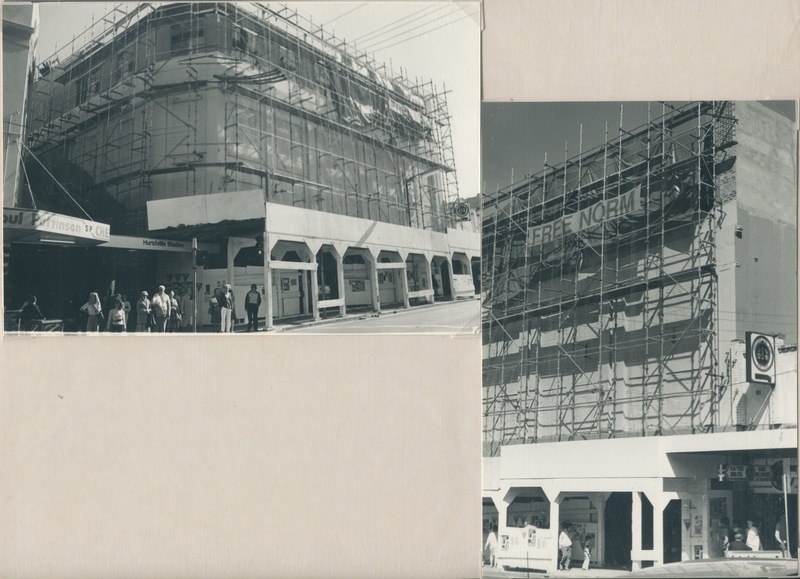 In those days they also had a department selling prints and lighting near the current electricals. 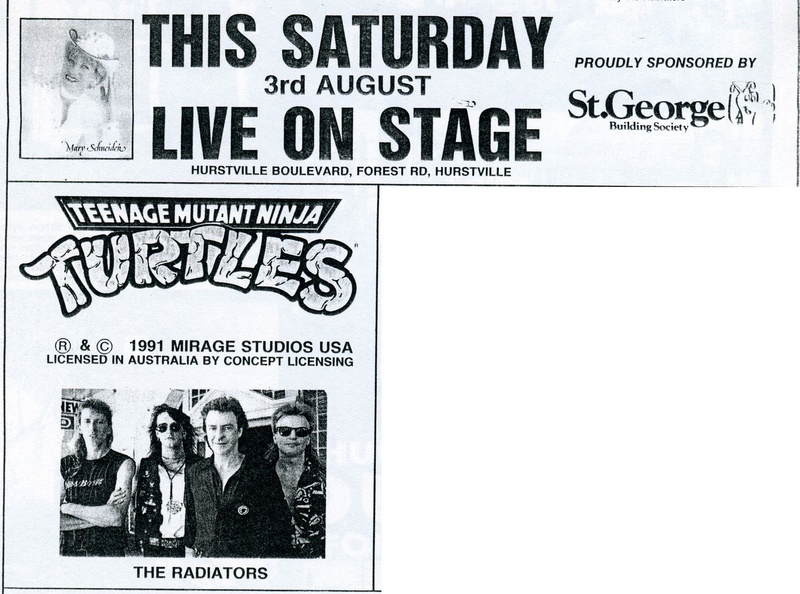 Once they became Myer they gradually went down hill after that. 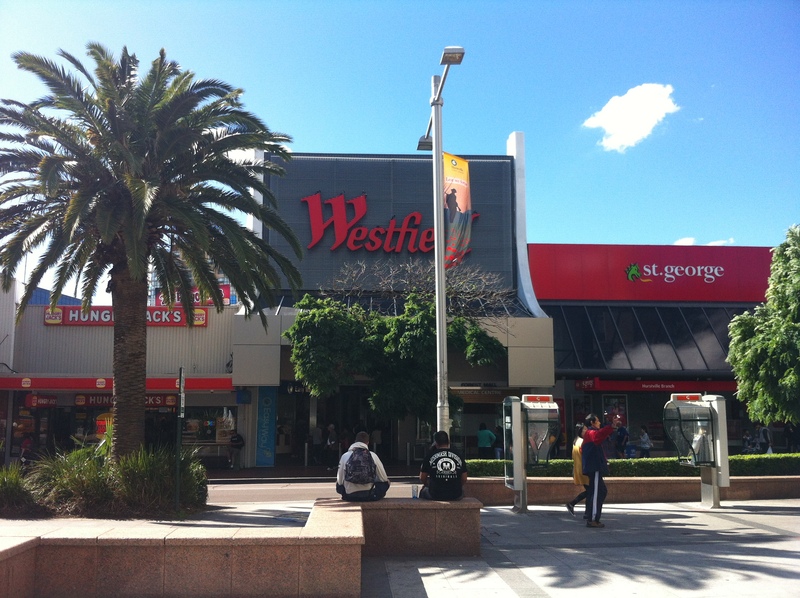 And apparently they will be completely out by early 2015 making it the first westfield I know without either a DJs or Myer. Apparently Myer is moving because of a tenancy dispute. Sounds eerily similar to what happened with Burwood except that was a stitched up deal from the start. I hope DJ’s enjoys the massive amounts of theft that store offers. I worked at Myer there and only know too well how much walks out that door unpaid for. 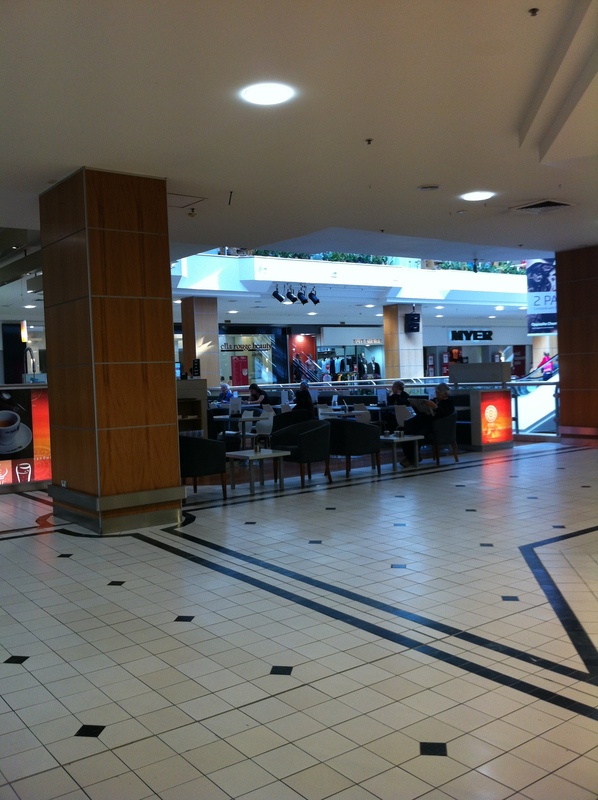 It will be sad to see Myer go. I will always prefer to remember it as GB’s though. It’s a comfortable shop to go to, you don’t feel harassed and most of the ft and pt team members have been around since day dot. They are offering them jobs in other stores. They won’t open a new one like they did with Bankstown when Burwood closed. Too much money has gone into Miranda I reckon. In the actual store, you can definitely still see the pathway that the cafeteria followed. Not far from the Pixie Foto that used to be in there, which I as a smart arsed 13 yo, pulled faces for. Still have those photos and cringe. And they got rid of the Donut King. They had also been around in the centre for many years. It’s all this trendy healthy food that people want. Don’t be surprised if the upstairs tenancy at myer goes to big w or something like that. 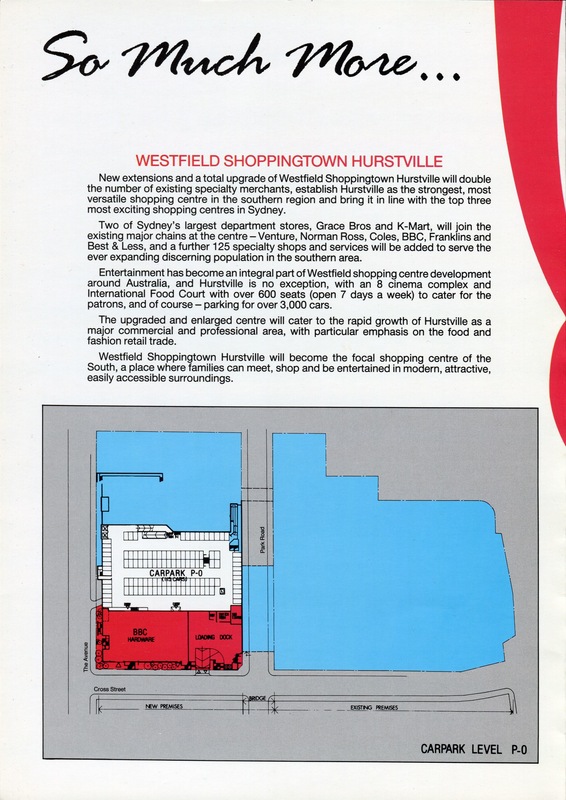 It will be the first Westfield without a major anchor. Hmm. They still need a JB HI FI there too. Catherine I heard about the closure from someone that works there and they said Big W are moving in. There is no way they will take two floors so maybe it will be JB HIFI with one of their mega stores with appliances etc taking up the other floor. 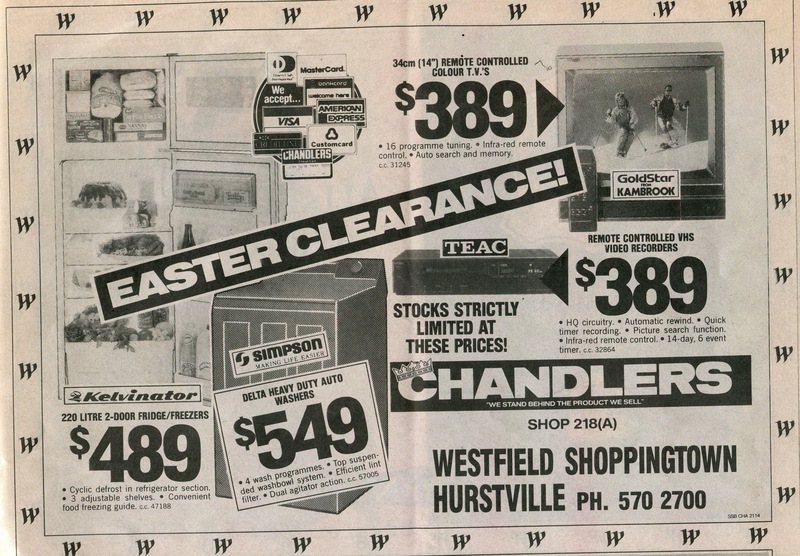 There is nowhere in Hurstville to really buy appliances etc since the days Norman Ross,Southern Hifi, Brashs, Chandlers moved out and Bing Lee in the Crosswalk arcade. Sounds like you had christened every ramp possible! That’s interesting, I don’t remember Wombat ever not being there, do you mean the current spot its in or when it was around the back? My childhood memory of southgate was the seashells at BHG. They had them on display on glas shelves which you could view from the outside of the shop. We used to buy at least one every time we went, and she also sold the chocolate cigarettes at the front counter. If I remember correctly Kaylas is there now and the glass on the shopfront kind of follows the same curves, only that I think BHG also took the space next door where the beautician is. 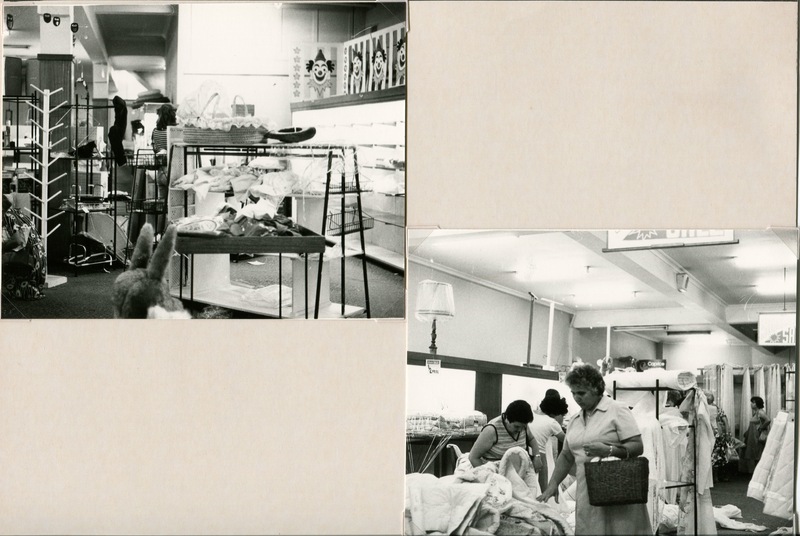 Kmart also used to carry better quality brands in those days. I’ve managed most disasters tbh! Yes Kmart definitely had better brands back in the old days. The Wombat next to what is Telstra now. I remember buying my plastic dummy back in that shop many years ago. I still have it. Crazes kids go through! 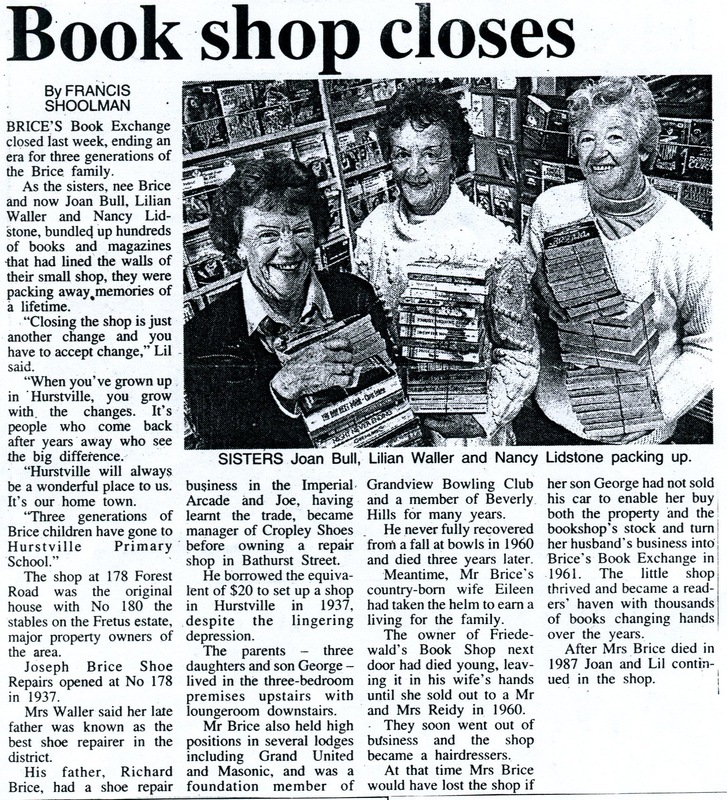 I remember this funny little shop which was next to the Bakery, opposite the hair dresser down from Sussan. Had big glass cabinets but I don’t remember it selling much. Went in there a couple of times to look. The fruit market down the end where the chemist is now was a good shop. Always bought our fresh stuff there, but if the prices were too high we would stop off at the St George Fruit Market at South Hursty. They used to sell the push pops there the first time they were around. And the hours spent in Jewel Supermarket. Was sad when that went and it became the Woolworths. I went in there not long ago and it was a strange feeling. I remember Jewel so well. Wasn’t a busy store at all either. 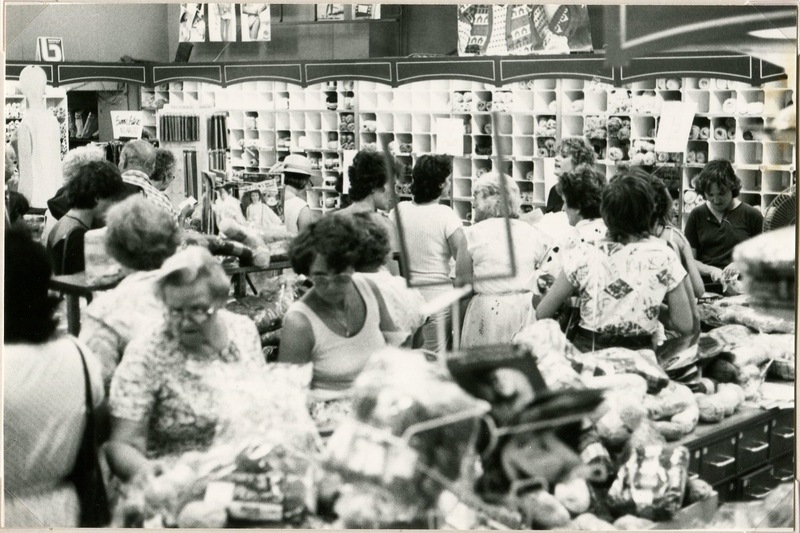 Coles had most of the customers. Back then our two trolleys we would get (and we were rake thin too) would cost about $120 and that seemed expensive. 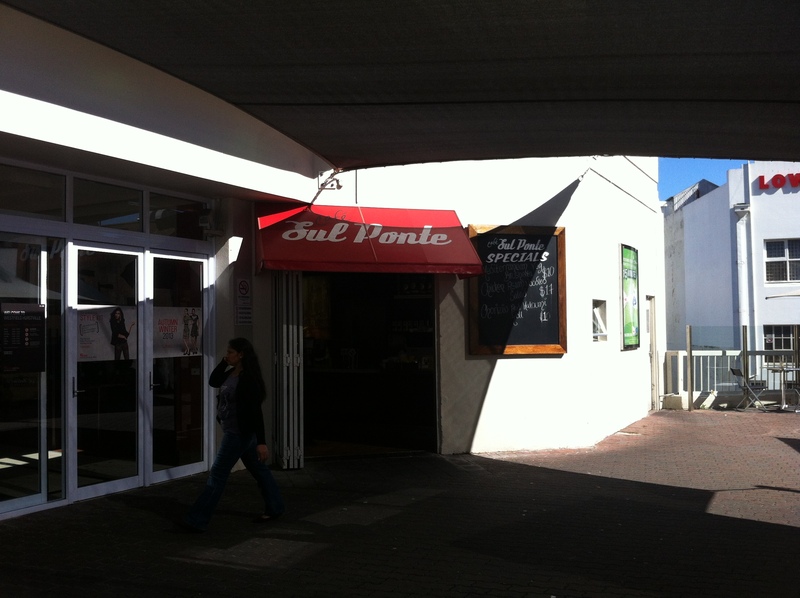 And the cut price deli on the corner near the ramp. That was there for donkeys. And that awesome hamburger shop that was across from Jewel – they did the best food. Shame they went too! Actually Events could be considered an original tenant even though it was initially called September and I think is the only shop that has kept its original location. Also the Colonnade, Sussan,Sportgirl, Katies always had a spot from day 1. Cue and Sheike came not long after. Of course the quality of all these stores has deteriorated enormously, especially Katies. cue is still up there but so are the prices. Do you remember when Sportgirl carried Sportscraft and David Lawrence when it was down on the corner where that Sushi Bar is now? I once read an article where they attributed the only original tenant to be the chemist owners before the shop changed hands. Whether that is accurate or not is a different matter. 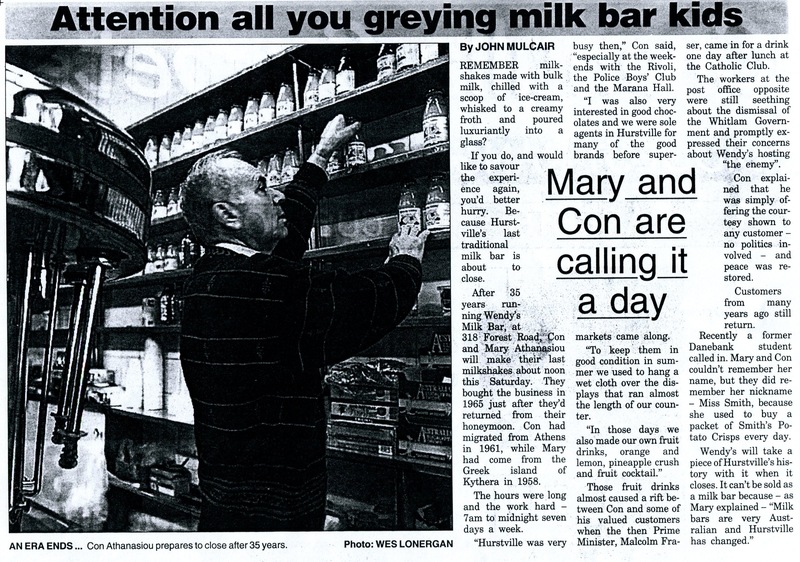 I do remember the Colonnade being there for a very long time. 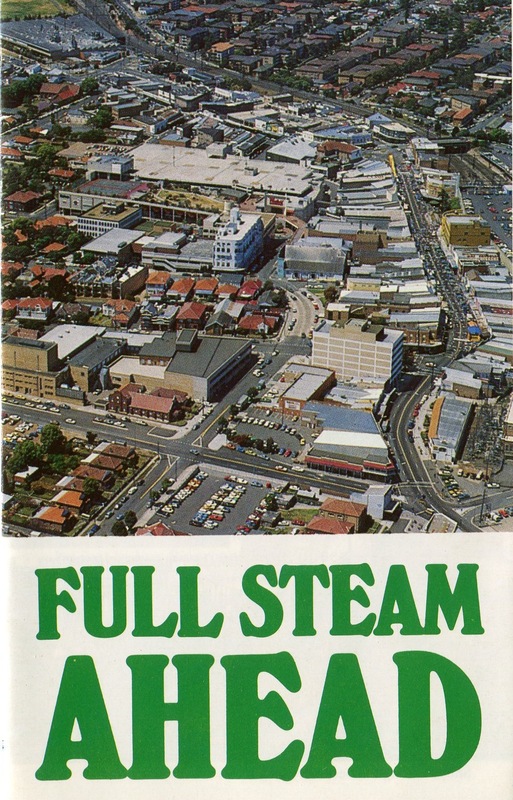 I can’t remember Hurstville without it. 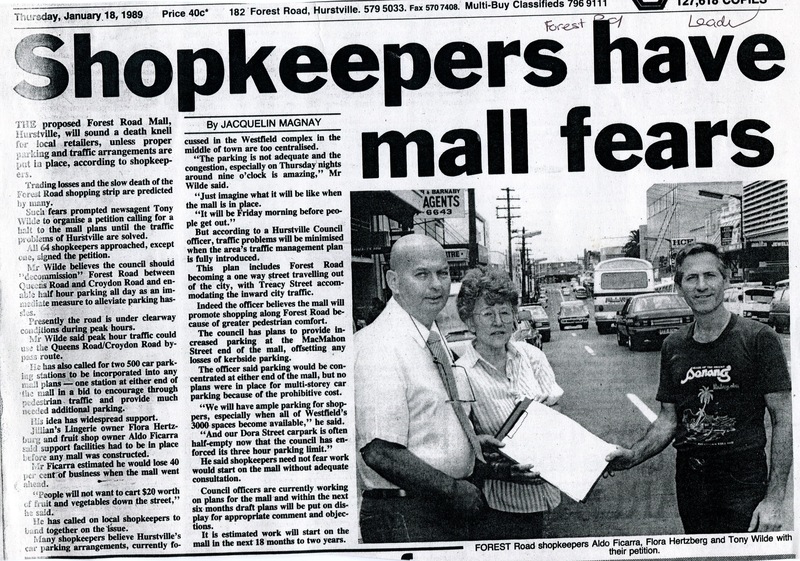 Same with the newsagency/giftshop next door. Cue has always been a pricey brand. Sussan is looking a bit shabby but there are some decent shops in the centre still. 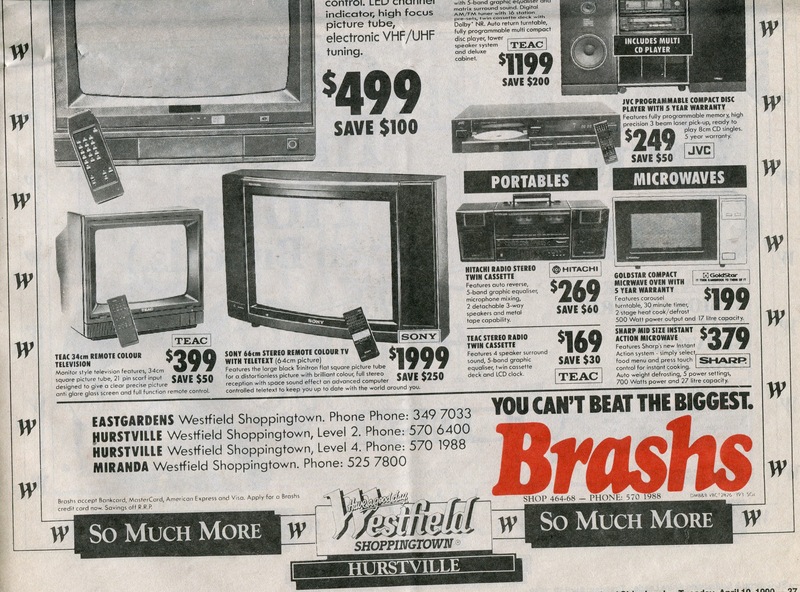 I remember Brashs being up the top near the food court back in the day, bought my first CD there. I didn’t pay attention to David Lawrence – so I can’t remember that one! 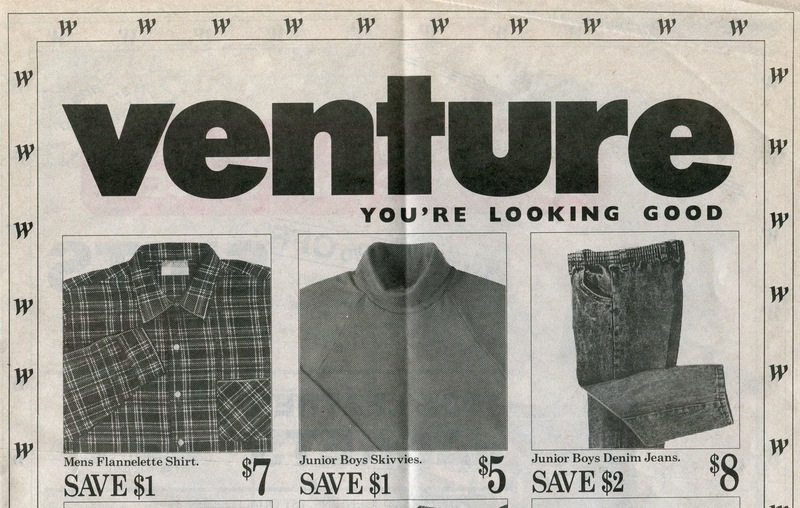 Do you remember a mens wear shop where Priceline extended its lease into? That was there for years. The place has changed so much when you actually sit down and think about it. Catherine not sure which Mens store you are referring to as before Priceline Sebel Furniture was in that space. There was one definitely there. I remember dad buying the odd item from the shop. I don’t remember Sebel being there. Catherine I have just realised why we are getting our wires crossed. And I will put my obsession with this issue to rest after this otherwise my husband will think I have well and truly gone mad. 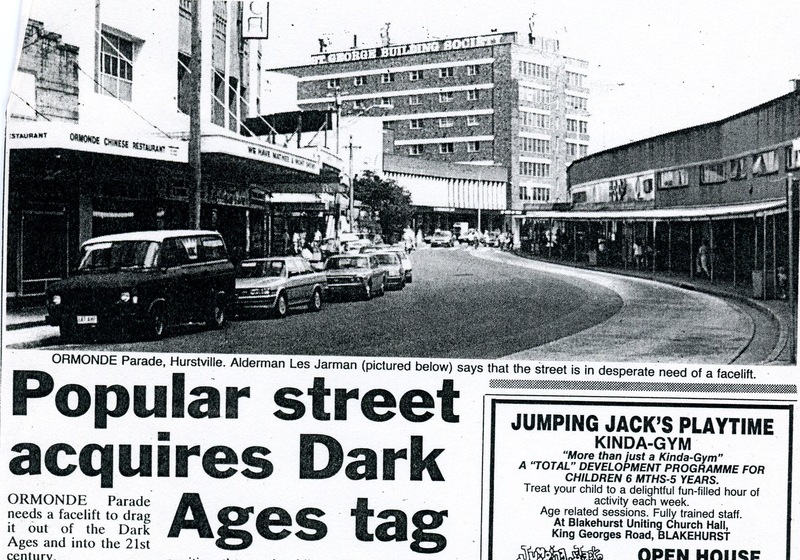 But what would he know, he only knows the hurstville of post 1999 so wouldn’t understand the tragedy of this whole saga! When you say the spot where Priceline “extended into” that is where I have mucked you up. See, Priceline originally started in shop 418, and so if it got extended into the shop next door which now I think about it I have a vague memory of, you mean Allen Bros which was shop 420 as at 1995 (but not prior to 90/91). Thank goodness for being able to consult the store directories from these articles. 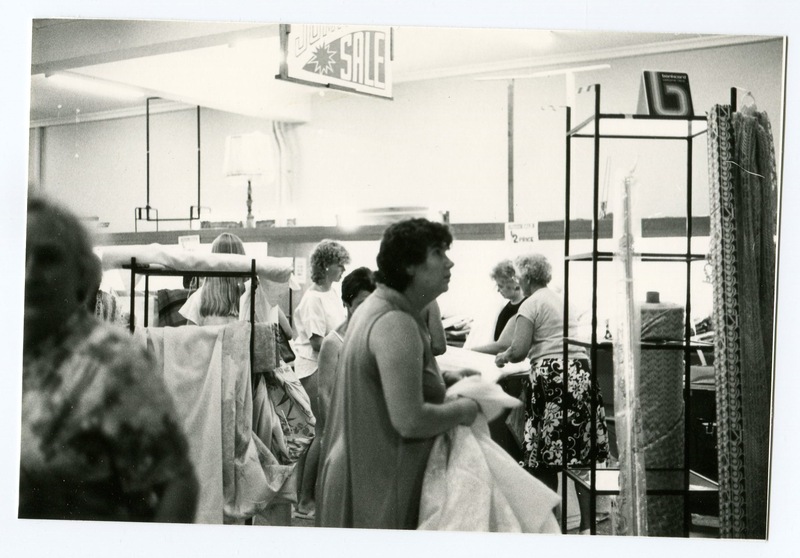 Sebel furniture was the original tenant of 418 when the centre first opened in 1978 (which to be honest as a preschooler I don’t remember). I don’t know how long that remained but the next oldest directory says it became Priceline by next store directory from 1983. 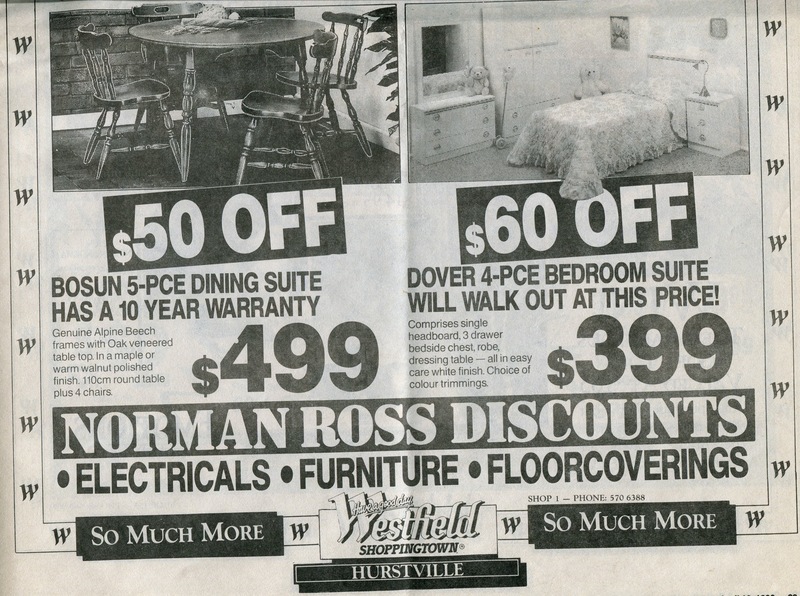 It has remained Priceline as you know ever since, but it was the extension of the store that I forgot about and confused me, but now that I think about it, that was around 87/88. So there, your memory serves you right, and as for me, I just wish I could turn back time! Yes I think we need to put this to bed! That is the shop I remember to be located there. You really don’t realise how long ago these things were until you have a year in front of you and it no longer becomes “a couple of years ago” but “nearly 20 years ago” and that is a strange feeling! But what would be awesome would be a similar story on Miranda or Southgate. Southgate had a nice cinema out the front and now its that awful neglected gym. That shopping centre alone offers an interesting story! Miranda… where to start with that one! Thanks – this has been fun! If you want any info Michael I can try to help. 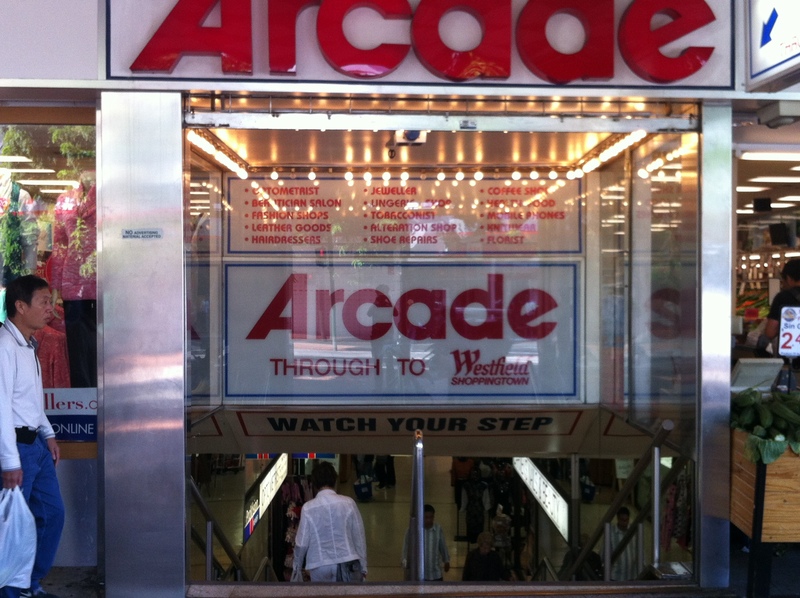 My family has been going there since it’s opening in 1983. I remember a lot of the original shops quite vividly. Southgate is my local now, I am there every other day. Miranda would be interesting too, vividly remember old shops like American Shoe Store, Table Eight and FWH. 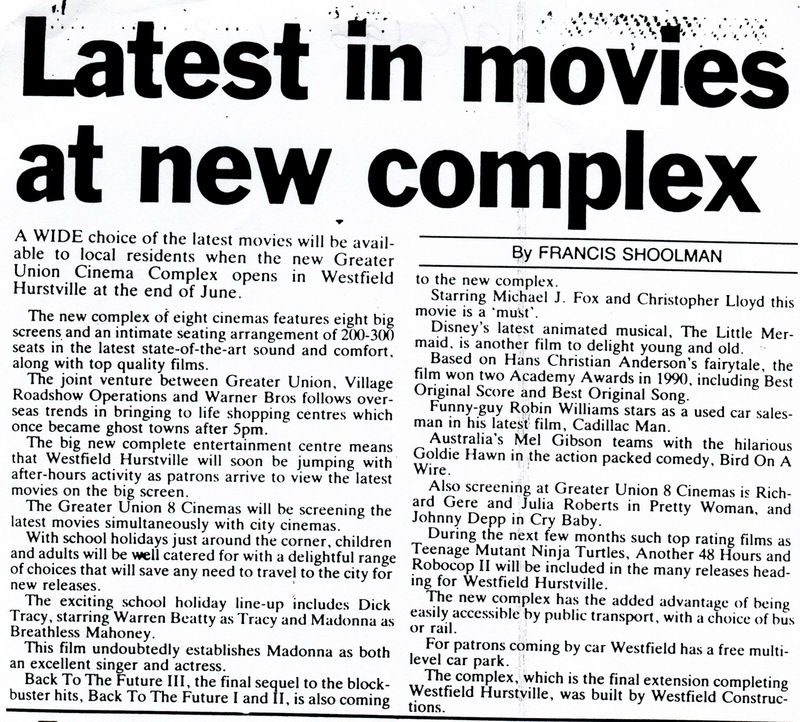 I remember going to the movies at Village Sylvania (now Fitness First) back in the mid 80s and also remember some stores now departed like Barbaras house and Garden, Divani, Katies, Soul Patterson Chemist, the original W Lane when it was called Wombat and was located elsewhere, Just Jeans, Sarcopelle which then turned into another high end shoe store and a few other kitchenware/gift stores. I remember the shop before Wombat went in. It was a games/toy store. I can’t remember all the store names but I can certainly remember what they sold. 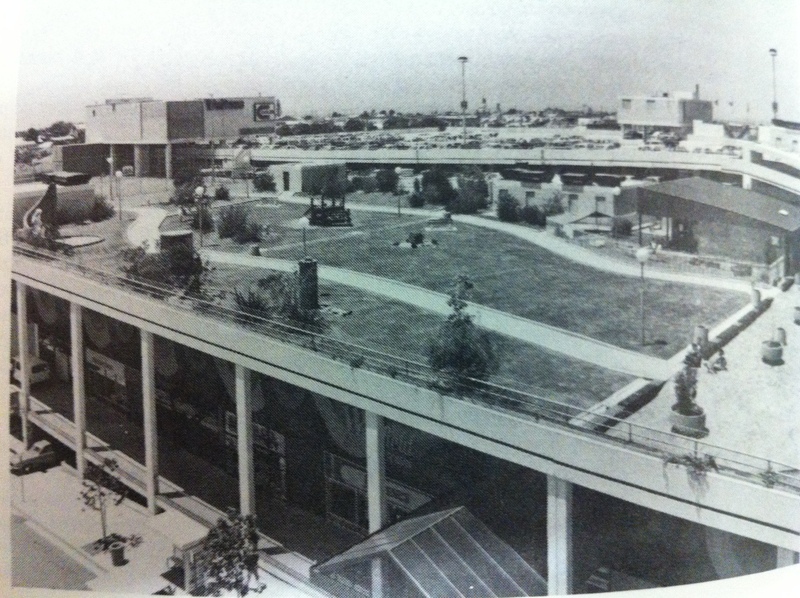 I also went for a skid on the old ramp that used to lead up to the roof top car park before they put the travelators in. Yes… disaster prone kid! It was a task pushing up the old Jewel trolleys up those ramps every week! The library down stairs hasn’t changed much. Still has our old Tintin books we used to borrow every week 🙂 For a change we might have shopped at Coles a few times and had the luxury of parcel pick up upstairs too. Good times. Catherine, just heard that Toys R Us are also going in January. 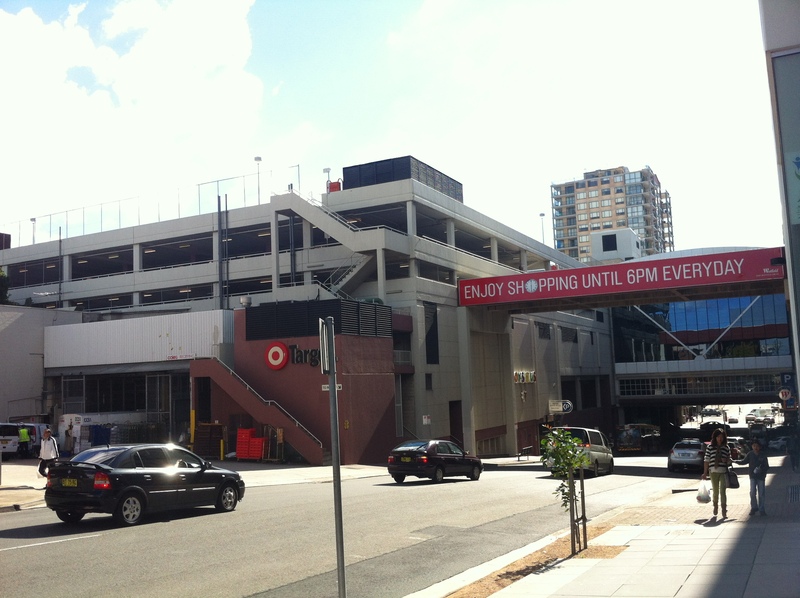 Well, that is probably the new site for JB Hifi! I wouldn’t be surprised Petta. People just aren’t buying enough toys there anymore to justify what would be astronomical rent for a shop that size. 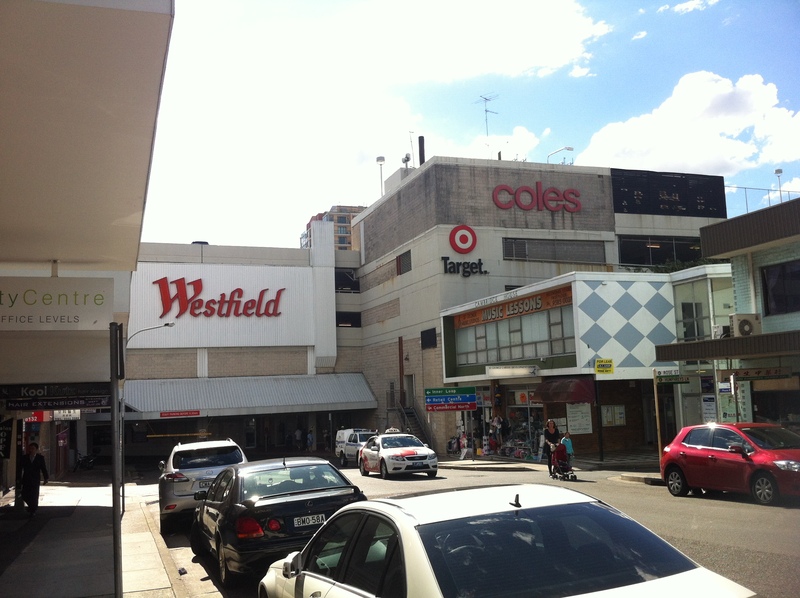 Kmart/Target/Myer have the toy bermuda triangle these days. Mid year laybys kill any competitor off. They obviously see the removal of Myer as a big change for the centre and want to kill off a few others as well. The screws will be tightening. Still wondering what they will do with the Food 4 Less site. What a great trip down memory lane. 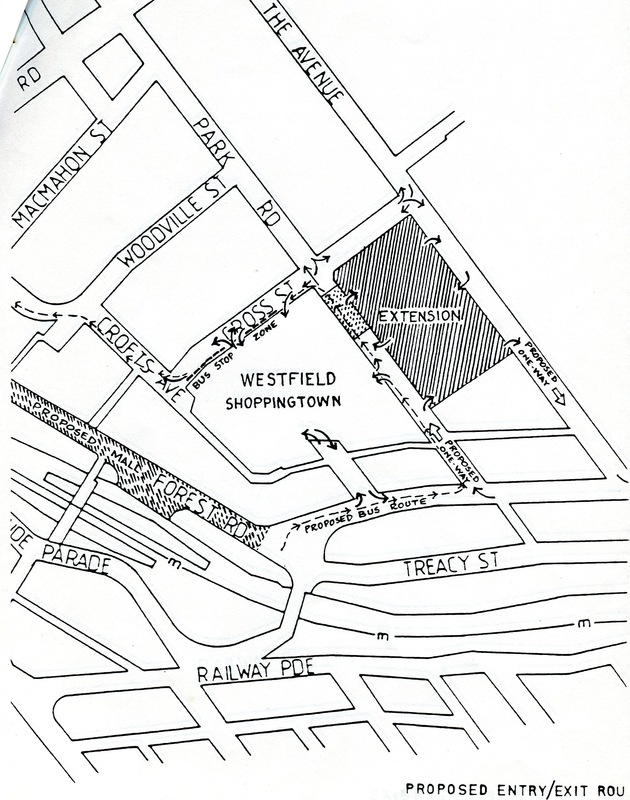 We lived in The Avenue and it is funny being able to see our old house before Westfield generously gobbled it up. 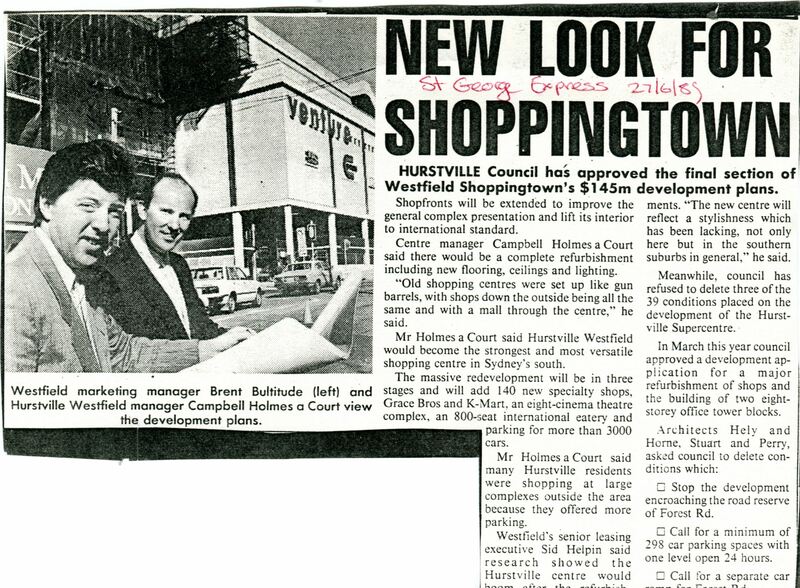 Westfield stage 1 was a playground for my mates and I during the construction stage. Great memories of the suburb. Shame how it has now turned out. Petta – I hope you’re right. I’ve gone directly to a contact at BIG W to find out if its going to be a BIGW/Wow combo or just BIGW. JB HI FI could always go in where the Food 4 Less shop is but then who would want to put a shop like that right next to a car park entrance. May as well kiss your profits good bye. I remember when the place was being built in the mid 70s. I’d walk past the building site every morning on my way to Hurstville Boys High School. 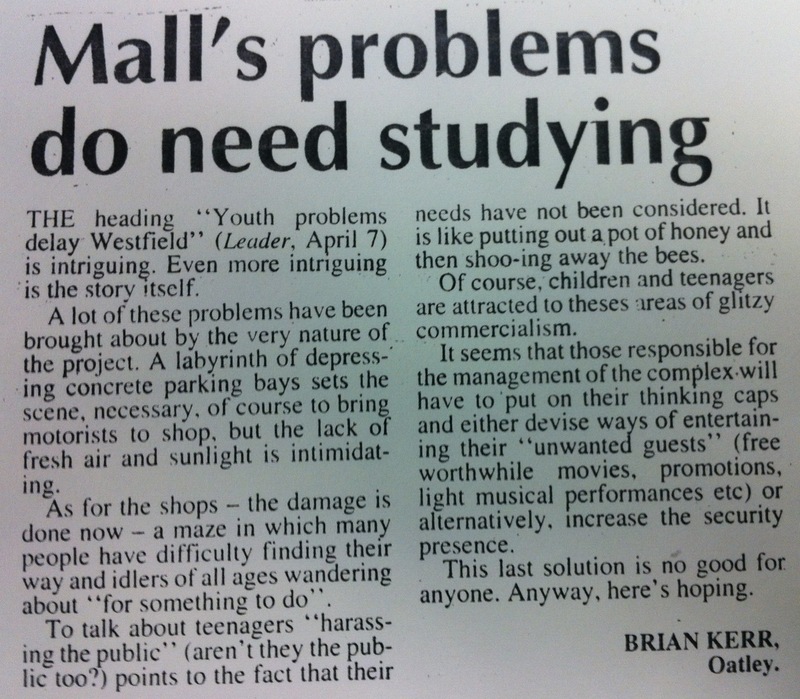 I left Sydney in 1988 so what happened to Westfield after that i’m learning here thanks to your awesome research! 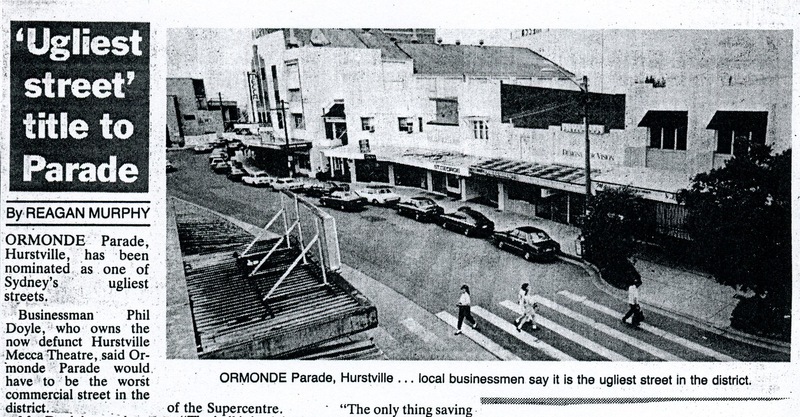 Any chance of a story about the Super Centre on Ormonde Pd and the Mecca theatre? I remember Boufflers fish and chip shop on Ormonde Pd and how we heard the owner’s daughter was tragically killed in the Granville disaster in 1977. Barters brought back heaps of memories , then it became a medical centre owned by the infamous Dr Edelston complete with a grand piano in the reception room!! 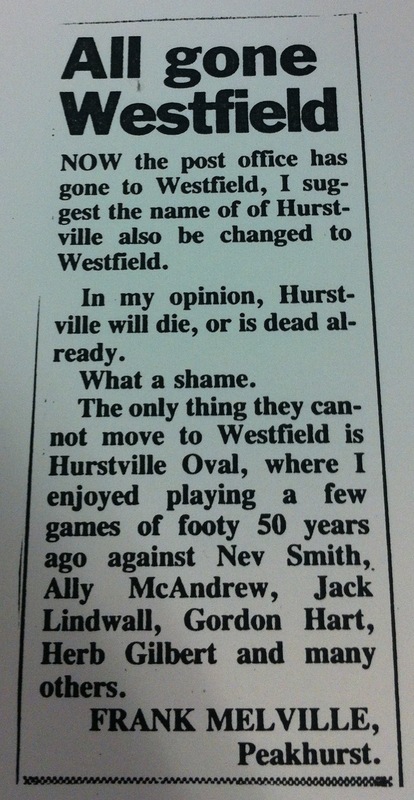 G. J., you’ll find something here on that Mecca if you search for Hurstville Savoy. I know it’s been a few years since this post was first uploaded but given that the centre has actually been renovated in the time since, what are your updated thoughts? Any improvement? Talking of K Mart….I recently had a conversation with some friends who did not believe that K Mart use to sell guns in the late 70’s early 80’s….google it and you will find the proof!